While many growers use just one or two favorite gardening methods, we use a wide variety. 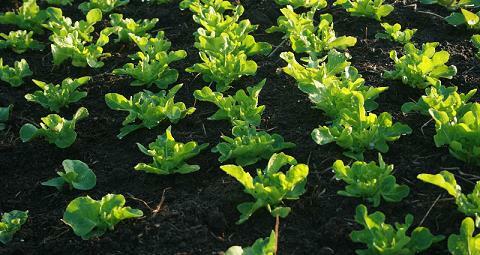 Some of those methods use soil as the growing medium. Others do not. To provide adequate room on the website to describe and discuss all these methods, we have categorized them all as either gardening, hydroponics or aquaponics methods. This section of the website will focus on the gardening methods. Most of our fresh veggie and herb crops are grown in a combination of the following gardening methods. We itemize them here so that folks can better see each method as it stands alone. But we also want to point out that they dovetail very well together. Raised beds are simply planting beds that are either slightly, or greatly, raised above the surrounding ground surface. Sometimes raising the bed requires only some wood planks, logs, or stones. We've even occassionally mounded the soil without a supporting frame. Other folks have raised their beds quite high, using several courses of stones, blocks, staw bales, railroad ties or whatever else they can find. The smallest raised beds are no more than large pots or planters. The largest raised beds we've seen stretch hundreds of feet long, and are formed by plows or cultivator shovels and shanks. However they are formed, they offer a variety of benefits. Click here to learn more about this method. The double digging and intensive planting methods are so closely related that I really have a hard time teasing them apart. Double digging is simply a way to prepare soil for planting such that instead of going down 6" or 8" or 12" or even 15", the soil is loosened as much as 24" down. That allows roots to easily go quite deep, instead of following the shallowly loose soils created by other tillage methods. Encouraging the roots to go deep not only helps insulate the plant from drought, it also allows plants to be grown much closer together. This in turn allows a much higher planting density than would normally be advisable, thus the partnership with intensive planting. This combo method offers a wide variety of advantages, but also a few drawbacks. Click here to read more about our experiences with this approach. No, this isn't a vegetarian lasagna-in-the-making. Rather, it's a way to prepare a planting bed by going up, rather than down. Basically, you layer various different natural materials in thin sheets, one on top of the other, until you have a sandwich of natural materials that will not only support but happily nourish a wide variety of fruits and vegetables. It has been a wonderful tool to use when tilling down simply wasn't an option. Mel Bartholomew's Square Foot Gardening approach may sound cutesie or clunky at first, but it's a darn good idea. The vast majority of us have grown up being taught to plant our gardens and farms in long, skinny rows. That is a huge waste of space, water, and soil. Thinking in terms of the square footage required by any given plant is a much more efficient and practical way to give each plant only as much room as it truly needs, while conserving soil, water and nutrients in the process. It dovetails extremely well with the other methods listed above. Oh, and it reduces weeding too. What's not to like? Click here to read more about this approach and our experiences with it. We haven't used this method as much as the others, but we've been pleased with what we've seen so far. This approach does not rely so much on how we've prepped the soil prior to planting, but rather how we treat the bed or field afterwards. Sometimes we'll spread the mulch prior to planting, then plant through it. Sometimes we'll spread the mulch afterwards. Either way, we've seen some interesting results from our intial experimentation. While not precisely a gardening method per se, season extenders are valuable to both hobbyist and commercial gardeners alike. These techniques help provide not only early and late gardening optionns, but they can also smooth out some of the weather extremes during the middle off the growing season. We've compiled a lot of information about various season extender methods, and summarized them all on our Season Extenders page. That page provides an overview, and then links to each of the individual techniques. We hope you find it useful.